Place to Be Bistro in Lake Havasu City is a family affair. Patriarch Gino Desisto mans the bar and the front of the house, while his son, Vinny Desisto, sets the menu and cooks the food. And, of course, as in any good restaurant, the chef is the main attraction. "He always had a gift for it," Gino said of his son. "We came out here for vacation and bought a place." Vinny Desisto, 33, started training as a cook at vocational school while in high school and continued to hone the craft in college. He trained at gastropubs in Philadelphia and ran a pizza place for a while. He cooks "new-age American comfort" - kicked-up bar food made entirely from scratch and with the love of his Italian grandma's home kitchen. "What I want to make, whatever I'm in the mood for, I make," he said. "I make the kind of stuff I'm trying to eat." 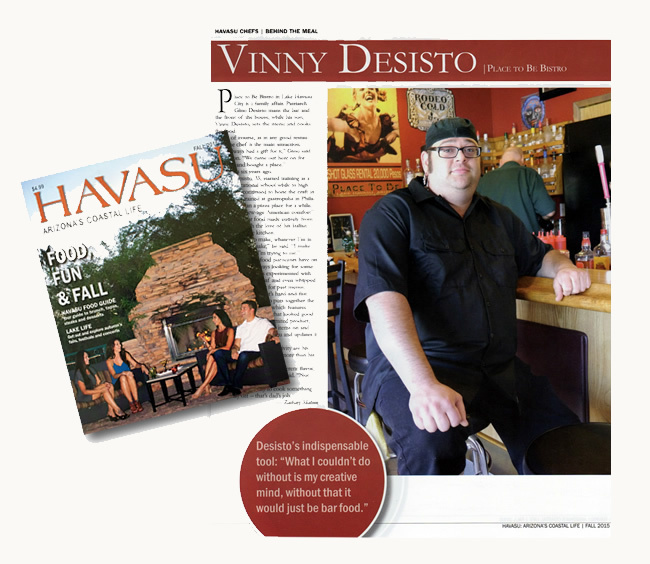 Hearing what his food purveyors have on hand, Desisto is always looking for something unique. He has experimented with wild boar, elk meatloaf and even whipped up a kangaroo burger for past menus. Beyond the restaurant's hard-and-fast standard menu, Desisto puts together the "ever changing menu," which features special items based on what looked good to him that week. With limited product, Desisto constantly moves items on and off the ever-changing menu and updates it almost daily. He said his mind and creativity are his most important tools, even more than his knives and tongs. "I'm trying to bring the different flavor, different feel to Havasu," he said. "Not run-of-the-mill stuff." But don't ask Vinny to cook something on his day off - that's dad's job.